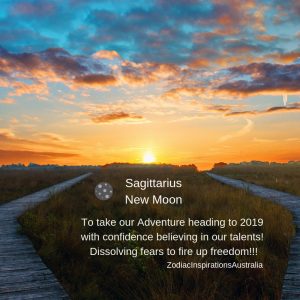 Sagittarius New Moon today 7DEC2018 at 6:20 pm!!! With Mercury Direct giving us the green light to search for adventure!!! This new moon is also challenging our dreams and actions. Why? There is a tight union between Neptune and Mars. For me the Universe invites us to dissolve the blinkers that our vision might have and embrace the talents we all have to take a journey that expands our hunger for adventure. What type of adventure is up to us! But take our adventure heading to 2019 with confidence believing in our talents! Dissolving fears to fire up freedom!!! This new moon is wrapped up with intuition encouraging us to believe and have faith in the threads of the Universe on our path. We all have been walking through a lot of change this year and we now are able to see the direction we see in front of us for 2019. Tonight write your intentions connecting with your intuition given the universe a little push to get involved for what we want for 2019! 2019 starts tonight because the next new moon will be an eclipse on the 6th of January 2019! Happy New Moon in Sagittarius everyone!! !